Over the past weeks and months, I have often dealt with Turkey's overt and covert involvement in Syria's not-so civil war next door. The country at the moment is home to at least 720,000 Syrian refugees. Only a small fraction of these have been registered and are housed in camps, with around 500,000 refugees living in urban centers throughout the country, and migrating west with the hope of ending up in Istanbul – Turkey officially estimates that about 120,000 Syrians actually live there now. These Syrians have risked life and limb to escape from the dangers of war. And now it turns out, these Syrian refugees have become a source of danger in their own right. The Turkish authorities are afraid of a sudden and fatal outbreak of the poliovirus (popularly better known as infantile paralysis) in Istanbul, a virus carried by the youngest of refugees now residing in the city. Between June 5 and 11, more than 500,000 children will be vaccinated against the poliovirus and to that end, specialist teams are now going door to door in an effort to inoculate the children of Syrian refugees. The wider city of Istanbul has been put on alert, with the aim of inoculating all foreign and particularly Syrian children (between the ages of 0 and 5) in six large districts – Fatih, Sultangazi, Esenler, Küçükçekmece, Sancaktepe and Ümraniye. But, in order to avoid widespread panic amongst the Turkish population, this far-reaching vaccination campaign is being carried out without any large-scale ad campaign, television spots or other means of spreading the word. In October 2013, the World Health Organization (WHO) said that polio had been detected amongst the children of Syrian refugees. From that date on, children under the age of 5, living in Turkish areas bordering Syria, have been inoculated – in the urban centers of Gaziantep, Hatay, Kilis, Şanlıurfa, Mardin, Şırnak and Adana to be precise. In Turkey, the most severe outbreak of the poliovirus dates back to November 1998, and since then there has not been another case seen in the country. As such, "[o]n 21 June 2002 the Regional Commission for the Certification of Poliomyelitis Eradication certified the European Region of the World Health Organization (WHO) as free of indigenous wild poliovirus transmission ... The European Region was the third polio-free WHO region, following the American and Western Pacific Regions,” as expressed in the Journal of General Virology. In fact, the disease had been all but eradicated by means of the Salk (1955) and Sabin (1962) vaccines, with only three countries worldwide at risk of becoming subject to a large-scale polio outbreak – Afghanistan, Pakistan, and Nigeria. But on a global scale, the health situation has now become much worse, with the effects of climate change, resource rivalry, and unchecked population growth (in certain areas) taking its toll, so that the American award-winning journalist Sarah Stillman can confidently claim that "Iraq, South Sudan, Somalia, Cameroon, and the Central African Republic, with recent appearances in Gaza and the West Bank" constitute "trouble spots" where the poliovirus can once again rear its more than ugly head and cripple the local population. Turkey, as part of the WHO European Region, was a safe zone where polio was under control and children routinely vaccinated. 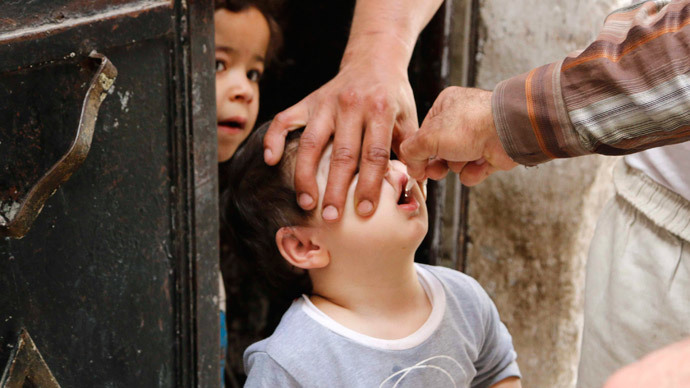 But Syria's not-so civil war has changed all that, and now "health agencies are warning of the risk of polio spreading across the Middle East from Syria" as summer approaches. The situation in Syria is troubling: "Vaccination rates in Syria have fallen from 91 percent in 2010 to just 68 percent in 2012 — and the number today is most likely much lower. Twenty five cases of polio have been confirmed in Syria, in addition to 84 cases of measles in the first week of 2014, according to the World Health Organization". The WHO itself issued this statement regarding the health situation in Syria: "[s]ince 2010, at least two immunization campaigns have been conducted every year across Syria. All national campaigns strive to reach all areas of the country, including those under opposition control. Activities in some areas of a country may be deferred due to a number of reasons, including active fighting or insecurity. Such areas are then tracked, and re-covered as rapidly as possible. For example, in the national campaign of December 2012, Deir Al Zour activities were deferred; the governorate was covered one month later in January 2013, and 67,000 children were vaccinated. Within five days of WHO’s polio alert on 19 October 2013 a vaccination campaign was launched, reaching an estimated 2.2 million children, including a reported 600,000 from Al-Raqqa, Rural Damascus and Deir Al Zour. Three vaccination rounds have now been conducted in Syria. The most recent national round, in January 2014, was carried out in all Governorates. Preliminary results suggest that vaccine coverage was greater than 85% in all but three of Syria’s governorates, and that coverage was greater than 75% in two of those three". 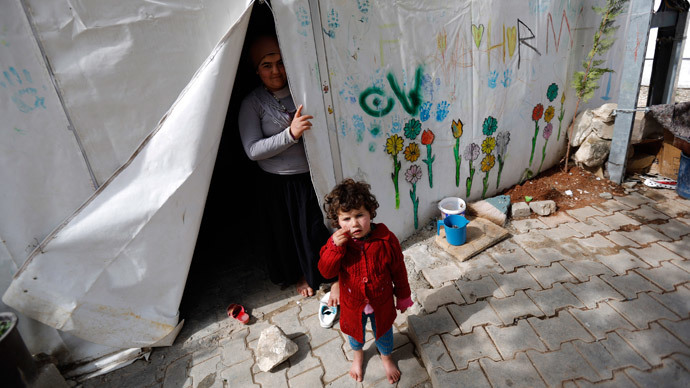 Still, the Turkish authorities are concerned and indicated that at the moment, everybody, irrespective of age or health, crossing the Turkish-Syrian border is liable to fall prey to the poliovirus. And in the further course of the summer more and more districts of the metropolitan area of Istanbul can become subject to an inoculation campaign. In view of rumors spreading online and through the grapevine, Turkey's Minister for Health Mehmet Müezzinoğlu has spoken to the press in an effort to calm the population and dispel unfounded stories and troubling gossip: "What part of a campaign, designed with the help of the scientific establishment, that we are applying in six large districts of Istanbul can we keep secret? Nobody has the right to spread rumors, to create panic. This is a matter of health. Health cannot be directed by means of sensationalist news flashes [or] gossip." Müezzinoğlu went on to say that our "[s]ociety needs to know that [our] ministry is taking all the necessary precautions, while doing all the requisite evaluations in conjunction with the scientific establishment [, arguably here referring to the WHO]. And we will continue to take [the necessary precautions]. There is no need now to spread any form of extraordinary panic or any kind of negative atmosphere as some seem willing to ferment. These are operations that we have informed the public of in a clear and open fashion". The Republic of Turkey now appears to be acting in accordance with the wishes of the WHO. Towards the end of last year, the organization published this stark warning: the "current poliomyelitis (polio) outbreak in the Syrian Arab Republic and remaining polio-endemic countries (Afghanistan, Nigeria and Pakistan), as well as frequent population movements and vaccination gaps in some European countries, increases the risk of the international spread of wild poliovirus. As long as the virus is circulating in the world and vaccination coverage is not optimal, polio threatens to return to the WHO European Region". Will Turkey's metropolis of Istanbul now become the gateway for the poliovirus' unexpected return to the European continent? Has Minister Müezzinoğlu the situation under control and will the current vaccination campaign prove to be sufficient? Or will Syria's not-so civil war be the source of a 21st-century polio epidemic that will once again engulf the whole wide world?